Meble Zieliński was founded in 1979. It was at that moment that the owner, Stanisław Zieliński, began his development, which continues to this day. The company’s mission was, and still is, to create unique, one-of-a-kind things. Passion and love for wood which have accompanied this business have also become the driving force of the Zieliński brand. Today Zieliński Furniture is an experienced family company, with a dedicated team of designers, carpenters with a modern, rich machine park. In our everyday work using the motto “Nothing is impossible” is standard for us, which also defines both our approach to projects entrusted to us, as well as cooperation with our partners. The main advantage of our offer is comprehensiveness, punctuality and perfection of workmanship. We offer the highest quality of service and furniture to our individual and institutional clients. During work, we use only proven materials of the best brands on the market. Many years of experience, an above-average machine park and our qualified team enable us to create things that would be impossible for our competitors. The key is in the detail . The “Meble Zielinski” brand is 40 years of experience on the furniture market and dozens of individual projects of office, kitchen, bathroom, room and specialist furniture (e.g. doctors’ offices). We offer professional service in the field of arrangement, technical advice, selection of stylistics and colour of furniture. In order to meet the expectations of the interior design market, we are pleased to offer cooperation in the field of furniture construction and assembly based on your designs. Our unquestionable advantage is the ability to make any shape and type of furniture from the most fashionable and the most effective materials. The motto that accompanies us on a daily basis: “Nothing is impossible” is not just an advertising slogan in our case. 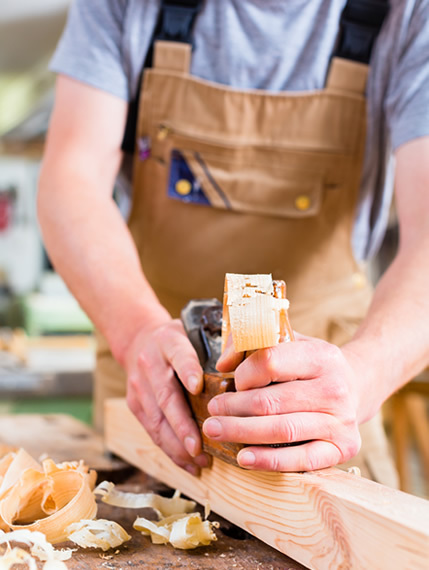 By supporting businesses in the carpentry industry, our company has launched services related to the pre-treatment of wood. We invite you to use our machine park , where you will find, among others, a CNC for processing wood and boards and a panel saw. We also have our own paint shop and press for veneers. We provide services in the field of drilling, milling, varnishing, cutting and edge banding as well as veneering boards and fronts. We offer the highest quality at reasonable prices. We invite all interested parties to contact and cooperate with us.